View of deck and boardwalk to private beach, from the doorway. View of bedrooms from dining/ sitting area. 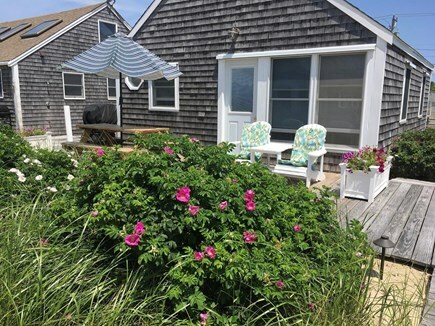 The Seashack is one of 14 privately owned condos located directly on Cape Cod Bay. 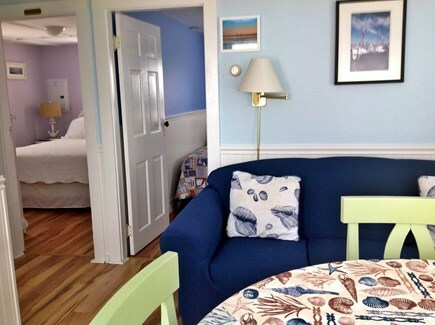 Our free standing cottage faces Cape Cod Bay with views of Longpoint Lighthouse. 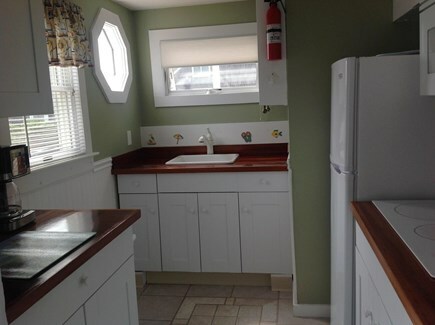 With approximately 480 sq feet of inside space, you will enjoy a clean, updated beach cottage experience. Two bedrooms will comfortably sleep 4 persons. Bedroom 1 has a queen bed, bedroom 2 has twin beds. *Please note: Maximum Occupancy is limited to 4 persons .A lovely view of the Bay and sunset can be seen from the full size sofa and hi top table in the living / dining space.There is a wall hung tv with built in DVD player. An updated kitchen also provides microwave,large cabinet space,coffee maker, toaster,4 burner ceramic counter cooktop, and 11 cubic ft refrigerator with freezer. There is a newly installed Fujitsu mini split AC/ heat system providing air conditioning. Outside, a large private deck area facing the bay has a picnic bench, umbrella, a two person adirondack bench, propane gas grill, and two beach chairs. 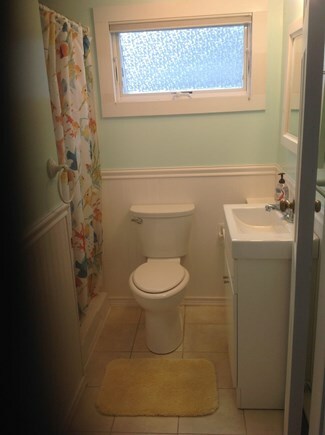 A non enclosed hot and cold outside shower is located on the side of the cottage. The private association beach is approximately 200 steps from the cottage. Beach access is made easy by use of the boardwalks. 2 designated parking spaces off street are provided for each unit. 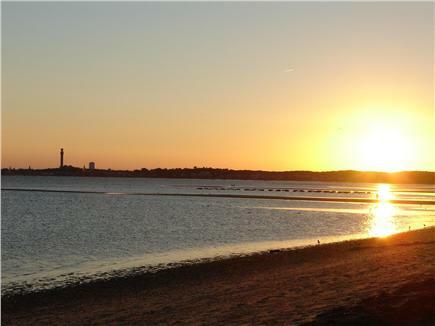 Provincetown center is a mere 1.5 miles from the complex, where you can enjoy an eclectic selection of restaurants, shops and activities. The Provincetown Shuttle is available for a small fee as an alternative means of transportation to town or ocean beaches. It will stop across the street from the complex for pickup at scheduled times. 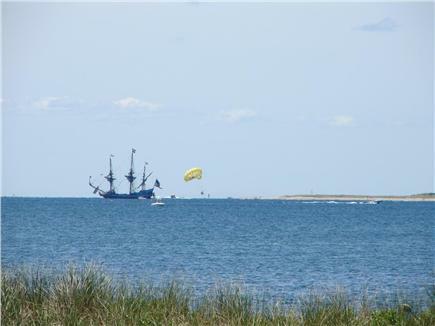 Highland Light,golf,ocean beaches, The National Seashore, and other activities are also located nearby. You will surely enjoy a relaxing vacation and splendid views of the dunes, beach and sunsets in our quiet, well kept association. Additional pricing info: Discount of $100.00 for each additional week (s). Refundable damage deposit: $350.00, State and local taxes of 12.45% will apply. We returned again to the cozy and quaint lovable Sea Shack for a well needed vacation. We found it as expected -- clean, comfortable, and with all the amenities required for our week's stay. Ann and Larry , the homeowners, greeted us and went through the various updates like new front gardens, bathroom and shower upgrades and recycling guidelines when we arrived. It was nice to be back at this unique property. It is a quick ride into Provincetown by bus which comes and goes on the hour making it easy to get around to visit some of our favorite spots like Pepe's, the Lobster Pot , Crown and Anchor and Governor Bradford as well as the hundreds of little speciality stores and restaurants around. There is a lot to see and do and if you are a walker, runner or cyclist there is lots of places to go like across the dunes, across the breakwater and the many different trails to the Herring Cove, Race Point or Head of the Meadow beaches. Or one can just stay at the cozy Sea Shack and walk out to the ocean and catch some rays at your own private beach. It is all there and we enjoy every minute of it during our vacation experience. We highly recommend the Sea Shack and we have found our hosts, Ann and Larry, pleasant and accommodating to make our experience with them as enjoyable as possible. Cozy cottage on the beach!!! This is a lovely, clean cottage right on a private beach! Located in a peaceful community, you walk out the door onto the sand. We are a family of four and it is the perfect size for us! The owners are wonderful people and very available to you if you have a need. All of the pictures are very accurate. We look forward to this vacation every year. It is our home away from home! The cottage was immaculate, awesome location, and wonderful owners who are there to make your vacation special. I will be back there next summer. We enjoyed it very much. Very clean and comfortable!!! We are a family of 4, very much looking forward to our third summer vacation at Sea Shack! This very clean, well-appointed little cottage is the perfect place to slip away from the world for a while. It sleeps 4 comfortably, with a master BR and a room with 2 twin beds. The living room and galley kitchen have everything you need to feel at home: cable TV and VCR, comfortable furnishings and updated appliances including a coffee maker and access to free wifi. But you won't want to stay inside. 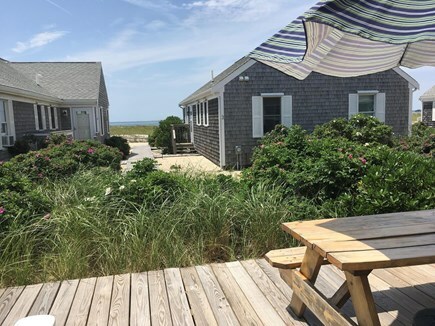 Located just a short walk across a boardwalk and through the dunes, you will find a bay side beach with a gorgeous view of Provincetown Light! Read, sunbathe, swim, collect seashells. You can even call up and order SUP boards and kayaks to be delivered to the Sea Shack straight from the many outfitters in P-town. If the calm of the bay side is not for you, some of the country's best beaches on the Cape Cod National Seashore are just a short drive (or bike ride) away on the ocean side: Herring Cove and Race Point Beaches in P-town, and Head of the Meadow Beach and many more beaches in Truro and beyond. You can shop, eat, watch people, take a whale-watching trip, and explore the rich history of the Cape in P-town. You can visit a vineyard and find the many hidden beaches of Truro. You can just sit and enjoy the stunning natural beauty of sky and sand and sea on the deck of Sea Shack.